Hitherto, the Kommando had used III./KG 40’s air-to-ground frequency but changed to another as of 1 November. 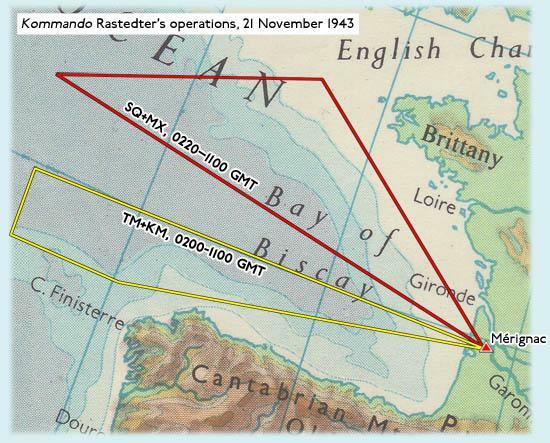 The normal one-aircraft overnight patrols were flown on the 2nd, 5th, 6th and 7th; the night of 8/9 November saw two He 111 aloft 45 minutes apart whereas just one machine was flying the night after that. The pattern changed entirely on the 10th, leading British analysts to used the report heading “Operations by Special Detachment (?) (Bordeaux)”: a Ju 188 was to operate from 0630–1200 and a Ju 88 from 1800–2315 but no wireless traffic was heard to establish whether they did indeed fly. We have good reason to suppose that enemy air reconnaissance picks up our disposition-lines by methods of location which in part we are still not able to get on to … In the field of radar location, equipment with detection-receiver ‘Naxos’ and ‘Borkum’ (as well as Wanze ‘G2’) will ensure radar search, without the drawbacks due to radiation, over all wave-bands so far known to be vital. Search of further wave-bands will be carried out by boats with special equipment. NOTE: The Borkum Detektorempfänger (detector receiver) covered roughly the 1–3 metre waveband and shared Naxos’s low-frequency amplifier. Statements by British W/T Operator indicate passive location … He has had two years’ A/S [anti-submarine] training, maintains that with the same location [gear] he can distinguish German U-boat from British submarine. 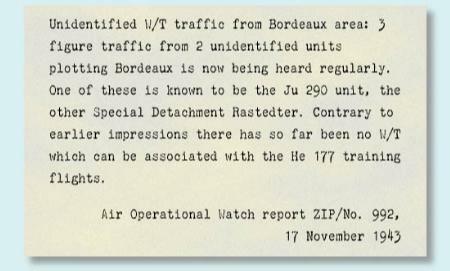 Operational Watch's report for the 13th speaks for the first time of the “‘RASTEDTER’ Special Detachment” (the name revealed by ULTRA, so almost certainly “’Rastedter’ Sonderkommando” in the original), noting that a Bordeaux ground station was active on the unit’s frequency from throughout the small hours and that a Ju 188 “which … may be connected with this detachment” was to start from that aerodrome at 0810 and return by 1400. The next day, it was planned that a Ju 188 should start at 1100 and return around six hours later, this flight being tentatively connected by the British with contact between “K” and Bordeaux early in the afternoon. On 15 November it was the turn of “G” which reported that it was breaking off its mission at 1358 and returning to base. Three sorties were planned for the next day: an He 111 up at 0050; a Ju 188 from 0200–0700 and another from 0600. This last was thought to have been “L” which was called unsuccessfully from 1400–1432. A Ju 88 was operating on the evening of the 17th and an He 111 in the early hours of the next morning. 12 November: After a search in BP 9100/9200 of Spanish fishing vessels suspected of carrying radar, the steamer PANSEMKA is being brought into the Gironde for search. 13 November: Five Spanish fishing vessels were brought into the Gironde for search … numerous further boats were searched at sea. Apart from normal radio sets, nothing was found. More information than before came through about operations proposed for the 21st, when a pair of He 111 were to take off at 0100 and 0120: TM+KM (He 111 H-6, W.Nr. 7580?) was to fly the route Mérignac – 24W 3671 – 24W 3411 – 14W 0411 – Mérignac; for SQ+MX (He 111 H-16, W.Nr. 161260) the course assigned was Mérignac – 14W 7961 – 24W 3711 – Mérignac. Two days later, unsuccessful calls were made to aircraft “L” under a radio protocol used by both the Sonderkommando and the He 177s newly arrived for Atlantic operations. Another individual aircraft is identifiable from the mission announced for the afternoon of 26 November, Ju 188 F-1, W.Nr. 280010 (NK+ZG). This machine flew again on the 29th on the route Mérignac – 24 West 1711 – 24 West 1671 – Mérignac, requesting a weather report from its base while heading for home at 1550; on the 30th it was the turn of SQ+MX once more, taking off at 0130 to fly Mérignac – 24 West 3724 – 24 West 3521 – Mérignac, a circuit expected to take around 7½ hours. 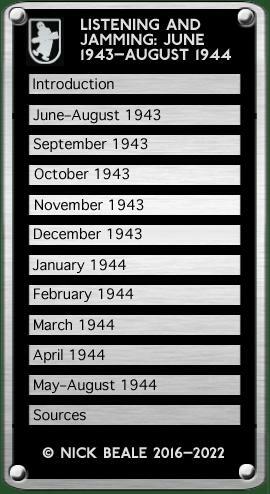 NOTE: Late in November, Allied Intelligence concluded that: “[Rastedter’s] aircraft use the last letter of their factory marking, not unit marking, as tactical callsign ‘G’ is Ju 188 NKZG, ‘X’ He 111 SQMX, ‘M’ He 111 TMKM.” They did not mention that this last aircraft had been active over the Mediterranean a year earlier, with Kdo. Koch. Aircraft attacking tactics continue apparently to be founded on an unknown method of location followed by attack with searchlight. ‘Naxos’ location has been reported by only one of the boats attacked … Attacks in inner Biscay by night have become more frequent again. Operation of own night fighters has just begun. No result is yet to hand. The electronic battle was not entirely one-sided for during November W.L. Horwood of Britain’s Royal Aircraft Establishment (RAE), Farnborough compiled a report about enemy jamming of ASV Mk. II and how operators might best deal with it. The paper does not discuss the sources of these German countermeasures but they are likely to have been ship- or shore-based since no airborne set is known to have been in service at this juncture.